OPEC's decision to cut aggregate production by 1.25 million barrels a day brought a ton of optimism into the oil market. However, price uncertainty still remains elevated as marginal well production comes back online, particularly from US onshore oil & gas businesses. Moreover, this industry shakeout could still be far from over with struggling operators pushing closer to financial distress and, in some cases, toward bankruptcy. With this backdrop, CreditRiskMonitor’s proprietary FRISK® score helps tell the very different stories behind Antero Resources Corporation (NYSE: AR) and Bonanza Creek Energy Inc (NYSE: BCEI). CreditRiskMonitor’s 96% accurate FRISK® score is used by over 35% of the Fortune 1000 and more than 1,000 other companies around the world to monitor public company financial risk. It examines a company’s market valuation, credit ratings, financials, and the crowdsourced activity of CreditRiskMonitor’s subscribers. The crowdsourced component is updated constantly and helps show which companies risk managers are most concerned about. Trade credit managers control the third largest source of debt funding in the corporate world, so if they are worried about a particular company, you should be too. It is a difficult task for risk managers to investigate every single company for financial risk with precision. So the FRISK® ranking system provides subscribers with a warning to indicate when a company needs further research. 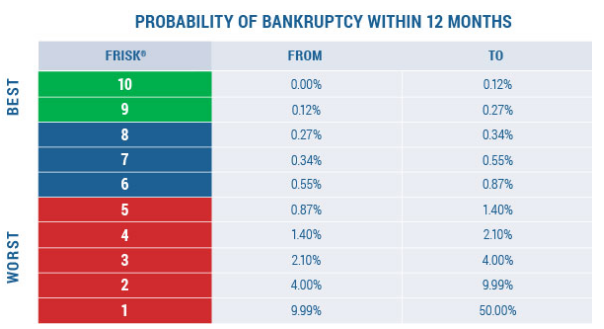 A score between 6 and 10 is considered financially stable, while a score of 5 or less represents trouble – a score of 1 indicates bankruptcy risk as high as 50% over the next twelve months. But the rank can be more than just an early warning system too, as it shows an underlying trend. A FRISK® score of 9 indicates to risk managers that the business maintains a strong financial position with an extremely low probability of distress. Of the four factors that contributed to the trend in the FRISK® score, the biggest impact for Antero came from the market valuation component, which is a broad, real time measure of sentiment. Although stock market sentiment is not a traditional gauge for assessing financial risk, it has been back-tested to signal and capture distress quickly, unlike conventional methods. Over the past year, Antero’s stock price volatility slowly decreased to a low level while market capitalization increased, both of which contributed a positive impact to the score. Antero’s agency rating, meanwhile, served as an important anchor for the score, as it remained unchanged at BB, non-investment grade. Although the ratings didn’t shift, it helped keep the company’s FRISK® score from falling further than it did. Credit ratings, which often only change slowly, help to offset some of the more active metrics in the FRISK® score. That dynamic effectively stops an excitable market from biasing the score too strongly in one direction or another. Antero’s financials, meanwhile, have remained reasonably strong. In this case, the Z” score, a good indicator of financial health, stood between 1.10 and 2.43 and yielded a neutral impact. The crowdsourced activity of CreditRiskMonitor’s subscribers had a limited effect. This factor can push a score lower by up to two points if subscriber research patterns suggest heightened concern about a company. That, however, wasn’t the case with Antero. High stock price volatility and a steeply negative year-over-year market cap return. Incremental credit downgrades from B to D, indicating a transition from speculative to near-term default risk. Financials deteriorating substantially, mostly attributed to poor working capital. Crowdsourced activity picking up, a negative signal, indicating heightened concern. Bonanza Creek is experiencing symptoms of high financial distress, inclusive of poor cash flow quality and liquidity shortfalls. As we can see, the FRISK® score has a dualistic nature in that it recognizes businesses recoveries and crunches, some of which can be hidden from plain sight! Simply put, this risk overlay serves as a powerful tool showing when people should be more or less alarmed about a company. The energy market remains challenging, and there are some operators handling the difficult conditions better than others. The FRISK® ranking system can help you assess the health of a public company quickly and with accuracy. Right now, it’s clear that Antero Resources is a name counterparties should not be worried about despite a tough period, while Bonanza Creek Energy was recognized as a concern over six months ago and its financial condition has only become more troubling. As everyone can see, knowing what companies to watch, and keep watching, is vital.